Home for the weekend was Rancho Durazno, a peach farm situated at the southern end of Palisade. The blossoms had already fallen, but the orchards were still in danger of frost for a few more weeks. Irrigation has been perfected by directing a portion of the Colorado river first to canals, then into drip irrigation systems. 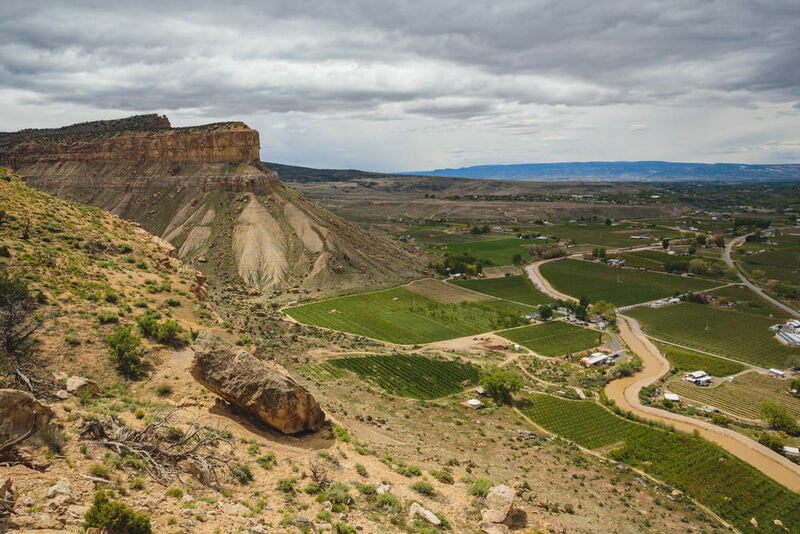 Above the ranch dominates Buzzard’s Roost, a mesa formation slowly retreating to the elements that serves a reminder of how dry the land naturally is. April brings the return of the Milky Way’s galactic center to the northern hemisphere’s skies, but visibility is difficult with spring rains. It is still worth the effort to wait the clouds out and receive a glimpse of the celestial lights. A series of hiking and mountain biking trails provide access to the surrounding mesas. The Stagecoach Trail is the remnant of a toll road built in the 1880s to connect Glenwood Springs with Grand Junction. Trips that previously took weeks were reduced to two days. The trail was only in service for several years as it was sold to the Denver and Rio Grande to serve as a roadbed for a new railroad line. On the Palisade Rim Trail, older history can be observed in the form of petroglyphs, still visible in the exposed rock from when the Ute people made camp. Returning from the western slope to Boulder, we were reminded of the variability of the state’s weather with a final dusting of snow on the Flatirons.